White Rabbit Pendant. Very Alice. 25mm Vintage Victorian style, photo charm pendant, on an 18" brass chain. 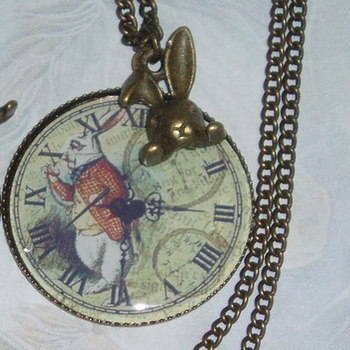 Featuring a handmade glass watch face cabochon with a rabbit and an antique bunny head charm. This is really beautiful and will be treasured by anyone who receives it.